The purpose of this assignment was to help us understand the important themes, motifs, and symbols in the story. Understanding these important literary devices deepens the meaning of the story by a great deal. It also forced us to analyze the story in our own ways and discuss our thoughts with other people. A motif is a recurring image or idea that contributes to the theme or a symbol. The four elements shown above are motifs because they are images that symbolize itself as well as something else. They also help to construct major themes. The first symbol is Tim Johnson. Tim was a rabid dog that Atticus shot and killed. In our group, we decided that Tim represented the prejudice that was present in society. Everybody living on the street where the rabid dog was wandering around wanted it dead. This took one characteristic quality of the dog and excluded it from all of the other dogs. He was killed for being different. Tim Johnson and Tom Robinson were extremely similar. The incident that occurred around Tim could be seen as foreshadowing what was coming for Tom Robinson. Tom was convicted almost completely because of his race. This showed the prejudice that was more than present in Maycomb. The second symbol is the flowers. For such a considerably small plant, the flowers play a large symbolizing role in the novel. As a group, we had a few disagreements over what the flowers symbolized. We came to the conclusion that the flowers represent the different social classes in a way. The geraniums, which belong to Mayella, represent the lower class. They were compared to weeds in the way that they sprout up everywhere, similarly to how the Ewells are considered the "weeds" of Maycomb. The azaleas represented those who go against societal norms. In Maycomb most people see their church as their community. Ms. Maudie goes against the people of the church who say that her flowers are sinful and vain. She has an excessive amount of pride for her flowers dispute the distaste from her fellow church-goers. The camellias represented the ever growing class of people who struggle with drug addiction. Mrs. Dubose was addicted to morphine for a long time and she died without any drugs in her system. She prevailed over the drugs in a comparable way the flowers survived after being ripped up by Jem. The mockingbird is an major symbol that represents innocence. The book makes it a focal point that it is a sin to kill a mockingbird because they do no harm. There are several characters that could be seen as the mockingbird. The two most important that our group decided upon were Boo and Tom. Tom is innocent of the crime which he was charged. He was only trying to help Mayella, he did no harm just as a mockingbird. Therefore, his death could be seen as a sin just as the killing of a mockingbird would be. The other character that is comparable to the mockingbird is Boo Radley. He is an extremely shy man who seems to always be helping the two Finch kids. He is exceptionally kind to them, he leaves them gifts in the tree hole and even saves Jem from Bob. In the act of saving Jem, Boo accidentally killed Bob Ewell. However, it was agreed upon that taking Boo out of his introverted lifestyle would be the equivalent of killing a mockingbird. In my group, we decided that the morphodite represented maturity. Throughout the story, the children are being thrown into adult like situations that most children their age would be oblivious to. As a child, it is not innate to discriminate against someone else because of differences, people have to be taught to do that. Jem, Scout, and Dill are introduced to the idea of racism in a dramatic way. The snowman is an powerful symbol because during the story it is both black and white. This highlights one of the most major themes in the story; discrimination based on race. All three kids were forced to mature rather quickly due to the circumstances that they were in, just as how the snowman melted from white to black because of the fire. Since a motif is reoccurring in a story, it helps to create a symbol because you are drawn back to a certain image repetitively. They appear at key points in the story to make you think about ways that the image could represent something deeper. 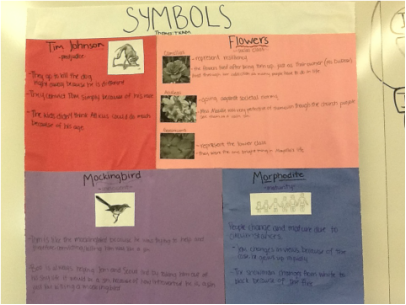 Harper Lee did a fantastic job, her symbols could represent many different ideas, but all are relevant to the story. Symbols allow you to process the story in your own way and leave it more open to discussion because they don't outright say what they mean. Motifs are important in helping you realize and recognize the authors significant symbols.